The other night I had a serious craving for Mexican food, but unfortunately, I didn’t have any of the correct ingredients for my usual staples. I had just used up the last of my ground turkey, I forgot tomatoes at the store, and used the last of my tortillas on some tasty quesadillas. Fail. I was nevertheless determined to make something to satisfy my craving, so I began rummaging through my pantry to see what I could find. 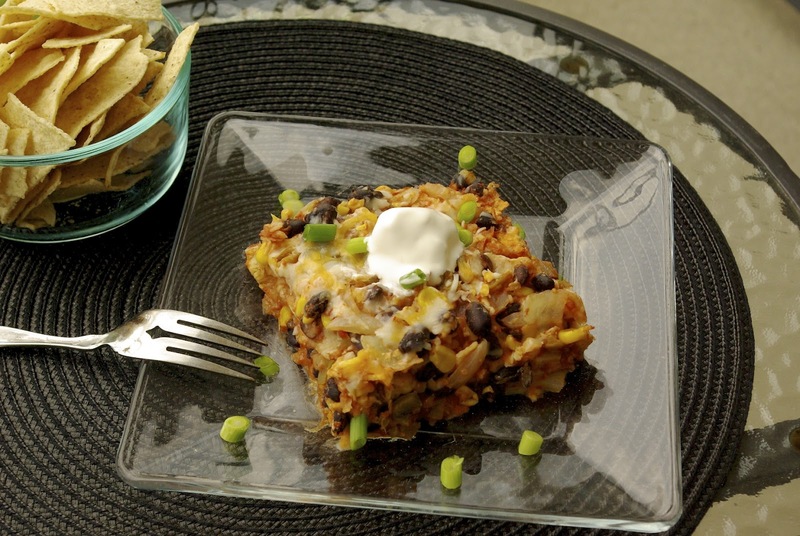 The result is a casserole of sorts, filled with black beans, chicken, salsa and a sweet pop of corn. To be honest, when putting this dish into the oven I wasn’t sure how it would turn out, but you know what? Sometimes that’s half the fun of cooking! Fortunately this particular recipe was a success, and even better, it is quite flexible; if you like things spicy, simply amp up the spices and the heat level of your salsa. Don’t eat meat? Leave out the chicken and add more beans. You could even make this vegan by leaving out the dairy, if you desire. This is also one of those recipes where the flavor improves as it sits, so if you have leftovers, you’re in luck! This dish is even more delicious for lunch the next day. Enjoy! Are you a recipe follower or do you like to experiment in the kitchen? Let me know below! Heat oil in a skillet over medium-high heat. Sauté onions until tender, about 5 minutes. Add garlic and continue sautéing an additional minute. Transfer onion and garlic to a large bowl and stir in chicken, black beans, corn, chili powder, cumin, salt, salsa, sour cream and 1/2 cup of cheese. Mix until well-combined. Transfer mixture to a greased 9×9 baking dish and top with remaining cheese. Cover with aluminum foil. Bake in 350 degree oven for 25-30 minutes, or until hot and bubbly. Remove foil and bake an additional 5-10 minutes, or until cheese is golden and melted. Let sit 5 – 10 minutes, cut into 4-6 pieces and serve with a dollop of sour cream on top. This looks really good! I have some black beans that need cooking, and this looks really comforting and warm. 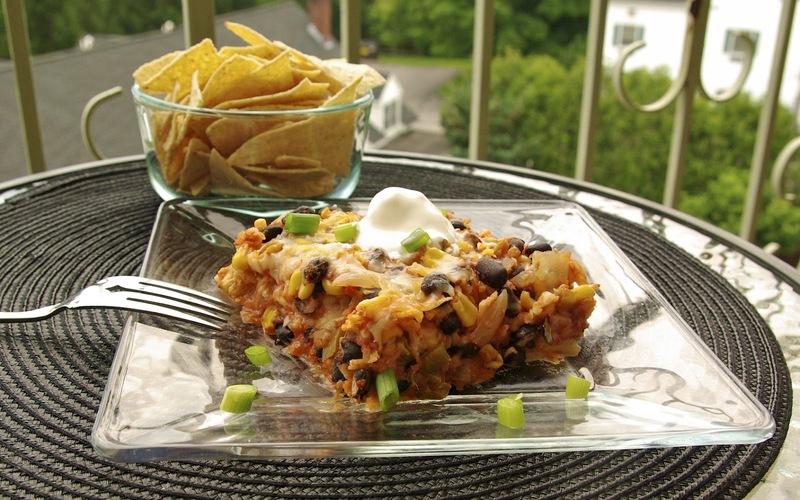 I will definitely make this the next time I have a craving for Mexican and comfort food.